February 10, 2008 -- PHILADELPHIA - Gomez is 28, he's in the first season of a sev en-year, $51.5 million contract, and he's been the New York Rangers ' best player in 2007-08. Jaromir Jagr will be 36 on Friday, he's in what appears to be the final season of his contract, and he's on pace for his least productive season since he was a rookie in 1990-91. 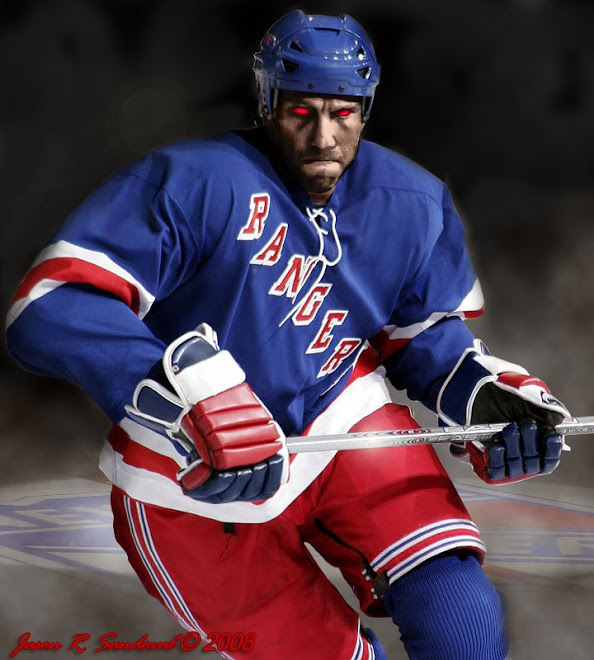 When the Rangers look to next year, Glen Sather's obligation will be to find a first-line right wing who is compatible with Gomez, rather than to find a first-line center who is compatible with Jagr. Which is why the Rangers GM is obligated now to find out what he can get in return for Jagr as the Feb. 26 trade deadline approaches. 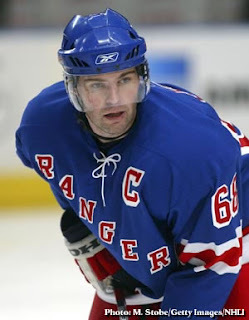 It is difficult now to conceive of the scenario under which Jagr will return to the Rangers next season. Before his latest slump, Jagr had just begun to navigate a reasonable path to 84 points and the initial option trigger on his contract. Now, though, that road seems a dead end. Held pointless in yesterday's 2-0 victory over the Flyers, Jagr needs 37 points in the final 24 games to hit the first trigger, with the second a playoff round victory for his team. Sadly, there is little in his body of work this season in which he had recorded 47 points in his first 57 games that suggests he is capable of mounting such a scoring surge. As such, without triggering an automatic one-year extension of his cap-friendly deal, Jagr will become an unrestricted free agent this summer. In that case, the Rangers owe it to themselves to see what bounty Jagr might bring back on the rental market. Surely he is a more proven and valuable commodity than Marian Hossa. Surely he is as equally attractive as Mats Sundin. In the right spot, on a team where he would be surrounded by more complementary talent and wouldn't necessarily have to carry the offense - Detroit, anyone? - Jagr could very well be the difference between winning a round or two and winning the Stanley Cup. This is not a call for Sather to give Jagr the bum's rush out of New York, my goodness it is not that. Jagr has been an immense Ranger throughout his Broadway tour; Sather's best acquisition and the best big-name acquisition since Mark Messier. Jagr is the individual most singularly responsible for the franchise's return to hockey credibility following the lockout. He has earned credit in New York. No one should ever forget that. Jagr put the Rangers on his back and carried the franchise out of the Dark Ages into this Renaissance Era. When the world believed the New York Rangers would finish at the bottom of the league in 2005-06, Jagr guaranteed a playoff berth on the first day of training camp and then delivered on that uncharacteristic pledge with a Hart Trophy-worthy campaign in which he established franchise records for goals (54) and points (123) in a season. The Rangers have changed since then. The Euro is no longer the currency in the room. Jagr has not changed. He can't or he won't after 17 years in the league in which he has carved a Top 25 all-time career. He wants and/or needs to play a slow-down puck-possession game with linemates who share his vision. Gomez needs to play a hurry-up, give-and-go game with linemates who share his speed. Jagr is a very bright, very aware individual, sensitive to his environment. He understands the situation as well as anyone. The fact is, whether he would ever publicly acknowledge this or not, Jagr likely would be better served himself by continuing his career elsewhere. Indeed, he probably would be best served by playing in the West, against defensemen who aren't so familiar with his game. As a Ranger, Jagr is matched against the same defensemen game after game after game. There's nothing he has that the Zdeno Charas, Hal Gills, Derian Hatchers and Mike Komisareks of the conference haven't seen dozens of times. He's begun to get pounded routinely again; punished as he holds on to the puck longer and longer, desperately trying to create something for himself, desperately trying to be the force he was two years ago, the force he was in Pittsburgh. Again. This is not a cry for the Rangers to dump Jagr. There is no reason whatsoever to send him away on the cheap. He does have the ability to get hot. He does present a huge challenge for a potential playoff opponent. This is, however, a reminder that that the Rangers have an obligation to investigate what they would be able to bring back for No. 68 on the rental market. Detroit should be interested. Phoenix and Wayne Gretzky should be interested. Dallas and Brett Hull should be interested. If even two teams are interested - and perhaps there would be five - Sather could raise the ante. This season has never been about only this season for the Rangers. This trade deadline can't only be about this season either. The future is about Gomez. The future may arrive as soon as Feb. 26. 1) We wouldn't necessarily praise Brooks for stating the obvious. We had JJ on the block long ago! JJ had one very good season in NY. He was probably the league MVP that year despite the Thornton win. 2) That said, Jagr looks like he wants out. We wouldn't blame his age. When he wants to play at a high level he still can. Which is why we agree that if traded to the right team he could be a huge factor down the stretch. For that reason we'd ONLY trade him to a Western Conference team. HHMM, think SJ and Ron Wilson(his former caps coach) would want him? San Jose is too fast for his level of play...I think he'd fare better on Detroit, surrounded by enough All-Stars to make him available mentally. I do think Brooks stated the obvious, but he took a speculative position on the captain - which is unlike him - and it begs how management will react to him having an opinion. i think he'll stick through the season and then he's gone. Brooks is right -- this is a Gomez team to build around.